[Chris Anderson] has had many labels in his lifetime: Punk rocker. Technology editor. Best selling author. UAV enthusiast. CEO. He now will also be able to add “Space Enabler” to that list as he joins The Hackaday Prize as an “Orbital Judge”. He will be on the panel choosing the Grand Prize winner (space-goer) from the list of five finalists. He joins the cast of “Launch Judges” who will be narrowing from 50 semifinalists down to 5. Chances are that you already know [Chris] in one way or another. His book Free: The Future of a Radical New Price was an early analysis of how free and freemium models are changing the way that businesses connect with customers. On the hardware side of things he is the author of The Long Tail and Makers, both of which discuss the specialty hardware market that we so often explore around here. He has been an editor for Nature, Science, and The Economist. He served as the Editor in Chief of Wired for nearly 10 years, and most recently he started DIYdrones, the 50K+ member community that works on open source software and hardware for UAVs and RC controlled flyers. This spawned a company called 3DRobotics, of which he is the co-founder and CEO. 3DR continues to push the frontier of Open Source Hardware for hobbyists and professional drone users. If you’ve been on the fence until now, this should convince you to take an afternoon to enter your project idea. You have until August 20th to document your concept of an Open, Connected device. Entry is easy and requires only that you outline your idea with a 2-minute video, proposed system diagram, and four project logs which may discuss different aspects of your plan. If you make the first cut of 50 in August, you’ll already be a winner of at the least a $1000 grab-bag of electronics. You’ll also be well on your way having [Chris] study your work as you advance to a functional prototype in November. Want a step-by-step view of putting together an entry in under 4 minutes? 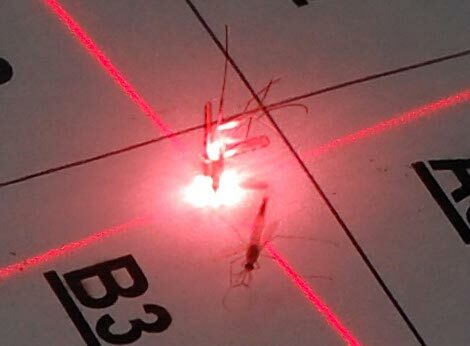 In a bid to combat malaria, Intellectual Ventures is developing a method of killing mosquitoes with lasers. The system is called a Photonic Fence and identifies the beasties by the frequency of their wing flapping (hey, that’s exactly how we know when they’re dive-bombing our heads). Once locked-on, it’s death to the filthy blood-suckers. This story was latched onto by the gambit of news sources in the middle of 2009. Since then, the development team has added some pretty interesting info on their webpage. Last Feburary several videos of mosquito flight were posted. These were shot at 6000 fps using specially designed photographic rigs (probably much like this one) to make sure the shots were in focus. Now they’re slated to give a talk at the 2010 TED conference. The publication of these talks sometimes lags behind by several months so be patient. Watch the video after the break to get some abstract shots of the hardware being used; they’re not giving up the goods until the conference. This new video about [Pranav Mistry’s] SixthSense project doesn’t bring us much that we haven’t seen before. At least, not on that project. What really caught our eye was the device he shows off at the beginning of the video. Using two old ball mice, he constructed a grip style input device. It is simple and elegant and we can definitely see using this in future hacks. Not only is it cheap and apparently effective, it seems as though it could be constructed in a very short amount of time. all you need are the wheels that spin when the ball moves, 4 springs and some string. Why didn’t we think of that?